Vienna 29 June 2017 — On Monday, 27 June 2017, the second draft of the “Treaty on the Prohibition of Nuclear Weapons” was released at the United Nations in New York. Delegations from more than 130 States will now work to finalize the treaty text by 7 July 2017. 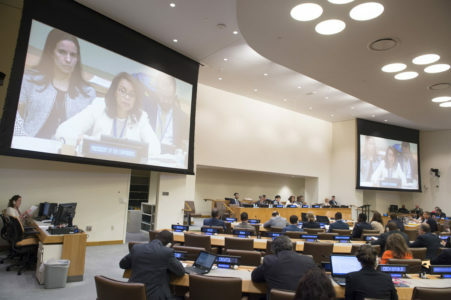 The United Nations Conference to Negotiate a Legally Binding Instrument to Prohibit Nuclear Weapons, Leading Towards their Total Elimination has been meeting at the UN in New York on 27–31 March and 15 June–7 July. Ambassador Elayne Whyte Gómez of Costa Rica is the Conference President, who has done a masterful job in navigating through the competing and often contradictory positions of both States and civil society organizations (CSO) to produce a realistic and workable draft Treaty text. The draft Treaty preamble recognizes that the Treaty on the Non-Proliferation of Nuclear Weapons (NPT) serves as the cornerstone of the nuclear disarmament and nuclear non-proliferation regime. All countries in the world are members of the NPT except for India, Israel, North Korea and Pakistan. It also affirms the vital importance of the Comprehensive Nuclear-Test-Ban Treaty (CTBT) and its verification regime as a core element of the nuclear disarmament and nuclear non-proliferation regime. The CTBT has been signed by 183 countries, but its entry into force is held up by 8 countries: China, Egypt, India, Iran, Israel, North Korea, Pakistan and United States. And, the draft Treaty recognizes the key role of the five nuclear-weapon-free zone (NWFZ) treaties of Latin America and the Caribbean, South Pacific, Asia, Africa and Central Asia, which all together have some 110 member States. The principal legally binding obligations of the draft nuclear weapon prohibition Treaty are contained in its first four articles. Article 1 contains the basic obligation for signatory States to never under any circumstances: (a) develop, produce, manufacture, otherwise acquire, possess or stockpile nuclear weapons or other nuclear explosive devices; (b) transfer to any recipient whatsoever nuclear weapons or other nuclear explosive devices or control over such weapons or explosive devices directly, or indirectly; (c) receive the transfer or control over nuclear weapons or other nuclear explosive devices directly, or indirectly; (d) use nuclear weapons; (e) carry out any nuclear weapon test explosion or any other nuclear explosion; (f) assist, encourage, or induce, in any way, anyone to engage in any activity prohibited to a State Party under this Treaty; and (g) seek or receive any assistance, in any way, from anyone to engage in any activity prohibited to a State Party under this Treaty. Also under Article 1, all signatory States undertake to prohibit and prevent in their territory or at any place under their jurisdiction or control: (a) any stationing, installation or deployment of any nuclear weapons or other nuclear explosive devices; and (b) any nuclear weapon test explosion or any other nuclear explosion. Article 4 on the total elimination of nuclear weapons requires any State party that owns, possesses or controls nuclear weapons or other nuclear explosive devices to immediately remove from operational status its nuclear weapon systems and destroy as soon as possible any nuclear weapons or nuclear explosive devices it owns, possesses or controls. Such State party shall submit a time-bound plan for the verified and irreversible destruction of its nuclear weapon programme to be negotiated with the States parties or with a competent authority [to be] designated by the States parties. And, each such State party shall submit annually to the UN Secretary-General a report on the progress made. Upon the dismantlement of its nuclear weapons or other nuclear explosive devices, such State party shall: (a) bring into force an agreement with the IAEA for the purpose of verification of the fulfilment of its obligations assumed under the Treaty with a view to preventing the diversion of nuclear energy from peaceful uses to nuclear weapons or other nuclear explosive devices, request the IAEA to verify the correctness and completeness of its inventory of nuclear materials, and cooperate with the IAEA in this regard. A competent international authority could be designated in the future to verify the irreversible destruction of nuclear weapon programmes. Again, the Conference President is wise to call upon the IAEA for verification of nuclear material only and not for verification of dismantlement or destruction of nuclear weapons or nuclear warheads as proposed by some. The IAEA has nearly 60 years of experience in verification of nuclear activities and nuclear materials in peaceful uses, but it has neither the expertise nor the experience for the verification of nuclear disarmament as this is not its principal mandate. While the IAEA has worked on understanding certain nascent nuclear-weapon development related activities in Iran, Iraq and Libya, and verified South Africa’s nuclear material following destruction of its 6 nuclear weapons by South Africa itself; the IAEA has had no experience in nuclear disarmament verification of mature nuclear weapon programmes and deployed arsenals. In fact, international verification of nuclear warhead disarmament is a bridge too far – even Russia and the US have no such experience; they only verify destruction of missiles and bombers as part of their arms reduction treaties. Efforts to devise a multilateral nuclear disarmament verification regime are unlikely to be successful and would end up as an exercise in vain. With only seven working days left before the conclusion of the UN Conference on prohibition of nuclear weapons on 7 July, it is now up to all participating States and CSOs to reach for practical achievable results, to support the President’s draft Treaty and avoid introducing amendments or additional articles. Sometimes “less is more” and this certainly is the case for the nuclear weapon prohibition treaty. Credit must be accorded to the Conference President and States such as Austria, Ireland, Sweden and Switzerland for seeking a practical and realistic treaty. Countries of the Non-Aligned Movement (NAM), CSOs and others should rally behind the President and finalize the draft Treaty pretty much “as is” rather than strive for making the best the enemy of the good! Tariq Rauf was Head of Verification and Security Policy Coordination at the International Atomic Energy Agency from 2002-2011. Presently he is a consulting advisor with the Comprehensive Nuclear-Test-Ban Treaty Organization in Vienna. Only personal views are expressed here.